While you might know that Cats Protection helps to both care for cats and find them a forever home, you might not be aware of the excellent work from some of our teams behind the scenes. One of our key aims is education, helping people within the community understand cats’ welfare needs, as well as explaining why they behave the way they do. In the quest to educate others on all things feline, our dedicated team of Community Education Officers and Education Volunteers travel around the country, offering interesting and informative talks to schools and community groups. Since the end of last year, the Education team has been working hard to create and deliver new talks and workshops. Catering to different ages and groups and even including talks for adults, the new sessions feature knowledgeable speakers alongside fun animations, videos and activities – great ways to interact with a young audience! Community Education Officer Kelly Matthews and Volunteer Education Speaker Helen Davies visited Lewis Girls’ School in Ystrad Mynach, Caerphilly, in July to deliver a new PSHE and careers workshop to the secondary school students there. Handily, Helen is also a teacher at the school and the session produced some interesting work from the pupils. The PSHE and careers workshop features four different videos documenting a ‘day in the life’ of some of the key careers at Cats Protection – including Cat Care Assistant, Neutering Officer and Vet Nurse. The videos linked to a quiz, where the students were asked questions about what they’d seen, reinforcing learning as well as highlighting the range of jobs available in animal welfare. Kelly said: "These new career videos are such a fun way to show the children the different careers within the charity. It’s lovely to see the reactions and interest we get from the pupils." After watching and learning, it was time for the students to put pen to paper and showcase their creative talents. They were asked to try out an activity relating to their best career match. 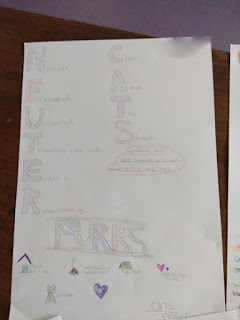 Those keen on becoming Neutering Officers were asked to create posters persuading people to neuter their cats, while those matched as a Media Officer were encouraged to create a press release promoting a hard-to-home cat. The results were particularly impressive. The girls had lots of wonderful ideas, coming up with some great work. Helen Davies comments: "The pupils really enjoyed this session. It gave them lots to think about and they found the activities engaging. As a teacher I can see this workshop being invaluable to secondary schools, and as a Volunteer Education Speaker, I look forward to delivering this workshop to pupils in other schools." For the students that chose to head down the career path of Neutering Officer and create a persuasive poster, there were some particularly funny and poignant pieces of work. 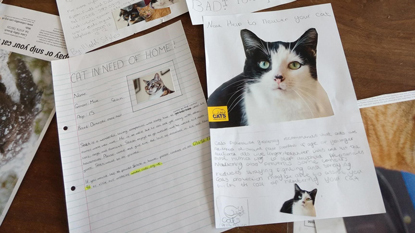 Others chose the Media Officer role, writing some excellent hard-to-home stories for cats. 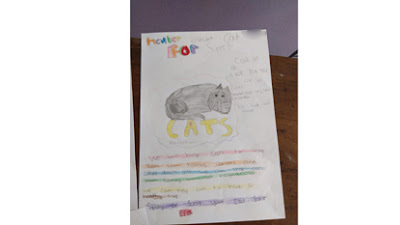 Kelly says: "The pupils enjoyed their activity session, learning about the various careers to be found at Cats Protection and the welfare needs of all cats. They also had great fun and went home feeling really happy with their creations." If you are a teacher or run a community group and are interested in a free talk or workshop from Cats Protection, visit www.cats.org.uk/book-a-talk to learn more.